Distance sensors are great! They're generally a maker's first step towards creating a basic autonomous robot, but did you know that there are many other uses for them? It's true! 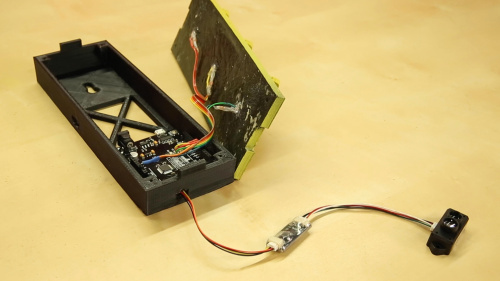 Everything from Halloween props to annoying musical instruments to parking garage guidance systems can be made using distance sensors. So let's take ours off the workbench and out into the wild, and make something happen! I've never had a tennis ball, boogie board or anything else hanging from my garage ceiling to let me know exactly when I should stop my car when pulling into the garage. However, now that I have a teenager who's about to start driving, I think maybe it's time. Now, I don't play tennis, but I do play electronics, so I'm going to use what I have available to me. My plan is to use a distance sensor and create a small stop light. When the car first pulls into the garage, a green LED will be illuminated. As the car gets closer, a yellow LED will light up, and when the car gets to the ideal stopping point, the driver will see a red LED. I'll design and 3D print a simple traffic light to use as the housing, so it will be aesthetically pleasing, too! 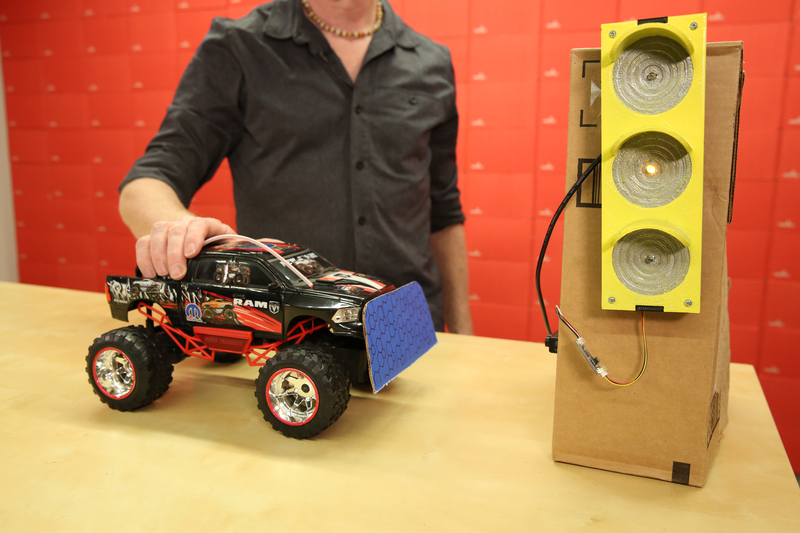 A quick demo to show off the new TFMini Stop Light (vehicle not to scale). So, which distance sensor is right? Gotta Get 'Em All! (I know, I know, but the actual phrase is trademarked). With so many distance/proximity sensors to choose from, how do you know which one is right for your project? There are a number of considerations, such as range, resolution, interface type, update rate and cost. Sometimes, you may need to decide which options have some flex (does it really need to update 635 times per second? 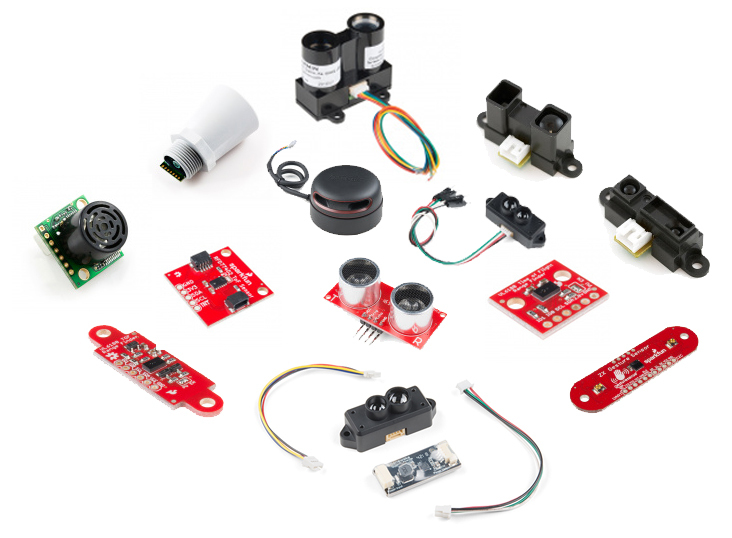 ), and which ones are must-haves (my professor said we have to use I2C components). My garage measures about twenty-six feet from the back wall to the garage door. While I could probably get away with one of our XL-MaxSonar Ultrasonic units, which are good up to about twenty five feet, for this build, I'm going to go with the TFMini - Micro LiDAR Module. I'm using it with the Qwiic package, as that includes a boost board. Since the TFMini runs on 5V but communicates at 3.3V, the boost board that comes with the Qwiic package eliminates the need for logic level conversion if using a 5V board, or a split power supply if using a 3.3V board. By pairing this with the Sparkfun Blackboard, which has a built-in Qwiic connector, I can make the sensor half of this hookup a straightfoward plug and play design. Add a few Super Bright LEDs, resistors and a power supply, and we're good to go! Here's the parts list for this project. This code is free, but if you find it useful, and we meet someday, you can buy me a beer (Beerware license). distance = incoming; //LSB of the distance value "Dist_L"
distance |= incoming << 8; //MSB of the distance value "Dist_H"
I also did a quick stop light model, and you can download that from the Github repository here. GOTCHA WARNING! Because of the power needs of the TFMini, and the power management system on the SparkFun Blackboard, if you try to run your final project with a power supply using the barrel jack, it will freeze up, the green LED will remain illuminated, and your driver, basing their actions solely on your sweet new project, will drive right into the wall. However, powering it through the microUSB connector works without issue. So even though that big beautiful barrel jack is staring right at you, tempting you, don't give in! It will only lead to misery. See the completed build here, in action! This build is about as quick and basic as they come, but it doesn't have to be. You've got the code, you've got the .STL files, now take them and run with them. Add some buttons to make it easier to adjust the optimal stopping distance. Create a better housing. Increase the number of LEDs to make it more visible. If you're feeling really ambitious, you might even swap out the Blackboard for a Raspberry Pi, and program this project in Python. Is there any advantage to using an SBC over a microcontroller for this project? Absolutely not. But why just kill a project when you can overkill it? Happy Hacking, friends! Two more thoughts about the code: using a "#define STOP_LIMIT 160" rather than having stopLimit as a variable would help preserve RAM (although for this program it's no big deal, but I have done Arduino programs where I ran out of RAM), or using "const int stopLimit=160;" at least gets the compiler to (try to) keep your code from "accidentally" changing the value. By the way, I like the "Beer License"! Thank you for that, and it absolutely doesn't feel like an attack at all. With most projects I do, even once it's up and running, I always feel like improvements could be made to my code. (That's especially true when pushing to meet a deadline, as is the case with every one of my posts.) If I recall, I think I kept stopLimit as a variable in case I had time to add a stopLImit Up and stopLimit Down button as inputs to more easily adjust that distance for the user. But if the user is a maker who's going to be putting it all together themselves, they could just as easily change the #define STOP_LIMIT number within their own code. Thanks for the feedback! Side note: the ambitious maker could also do the same sort of thing for "yellowLimit" (instead of my aforementioned YELLOW_LIMIT constant), having "yellowLimit Up" and "yellowLimit Down" buttons. Sorry... I spent too many years as an Engineer who always looking for easy-to-implement "features" to make Marketing happy... especially ones that don't need much additional hardware! Would it make sense to turn off the LEDs after a minute or so? Absolutely! If I had ten more minutes before this was due, that would have been the first addition I would have made to the code. i am in the early stages of building an automated dustbin, whose lid opens automatically once it senses footsteps approaching kindly let me the right sensors to use , i am based in Kenya. Glad you like it! The plan is to continue to take our components, and build them into practical projects like this. Hopefully it can inspire people to come up with ideas of what they can create next, once they've mastered the basics. A non-software solution to adding the "sleep" feature is to plug the power supply into the light socket on the garage door opener. Most openers have lights that turn on when the door is opened and turn off a minute or so after use. It would make sense to me to have a potentiometer that the user can adjust to set the stopping distances.